These are pretty wicked looking. 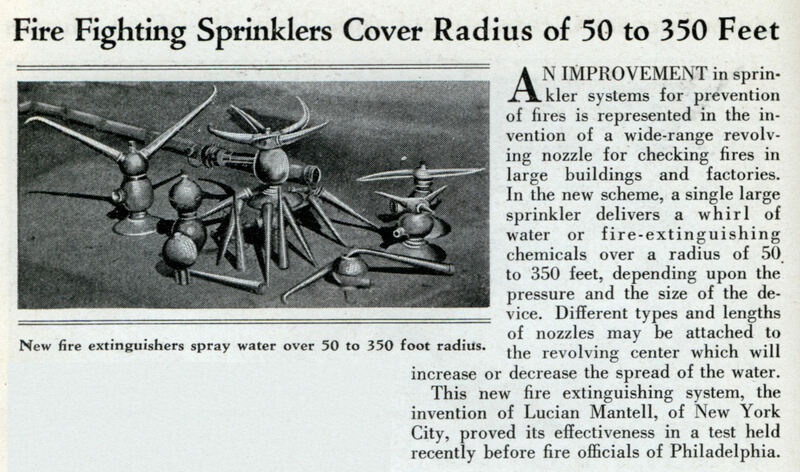 AN IMPROVEMENT in sprinkler systems for prevention of fires is represented in the invention of a wide-range revolving nozzle for checking fires in large buildings and factories. In the new scheme, a single large sprinkler delivers a whirl of water or fire-extinguishing chemicals over a radius of 50 to 350 feet, depending upon the pressure and the size of the device. Different types and lengths of nozzles may be attached to the revolving center which will increase or decrease the spread of the water. This new fire extinguishing system, the invention of Lucian Mantell, of New York City, proved its effectiveness in a test held recently before fire officials of Philadelphia.